Mrs. M.S Bandipo (holding microphone) lecturing participants at the Programme while Mrs. Modesta Ofodile (middle) and Dr. (Mrs.) Grace Sokoya listen. The Agricultural Media Resources and Extension Centre (AMREC), Federal University of Agriculture, Abeokuta (FUNAAB), recently held a Pilot Capacity Building Training on Grooming and Pre-Marital Counselling. The training was organised by the Gender Issues and Youth Development (GIYD) Programme, an arm of the Centre, where vital Issues pertaining to Pre-Marital Counselling and Grooming were discussed. Delivering her Opening Address, the Director, AMREC, Prof. (Mrs.) Carolyn Afolami, described the responsibilities of GIYD as improving the participatory capabilities of women and youths in the University mandate area with a view to assisting them in developing themselves, families, communities and the nation at large. Represented by Dr. (Mrs.) Grace Sokoya, she said the GIYD programme usually focus on Women Specific Issues, Gender Issues (Gender Specific and Gender-Sensitive Projects for farm-families) and Youth Development Issues (UNAAB Y-D Project). 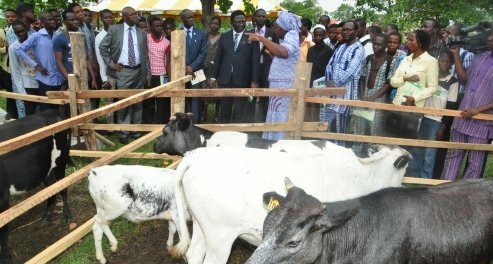 Prof. Afolami stressed that the GIYD programme had in the past restricted its activities and outreaches to the farm-families and youths in the University’s mandate area, to the exclusion of families within the University community. Alluding to an adage that says “charity begins at home”, Prof. Afolami asserted that, AMREC had a re-think on the need to include the University community in its catchment area and give men, women and youths in the community the opportunity to benefit first-hand, from some of the family-development activities of GIYD-AMREC. She however disclosed that the objective of the training was to discuss vital issues pertaining to Grooming and Pre-Marital Counselling for FUNAAB students, with a view to enhancing participants’ capacities of being well-groomed and making informed marital choices. In her Lecture, titled Good Grooming, Mrs. M.S Bandipo described Grooming to include personal hygiene, adding that looking good starts with feeling good, being properly dressed up, healthy, energetic and looking beautiful.